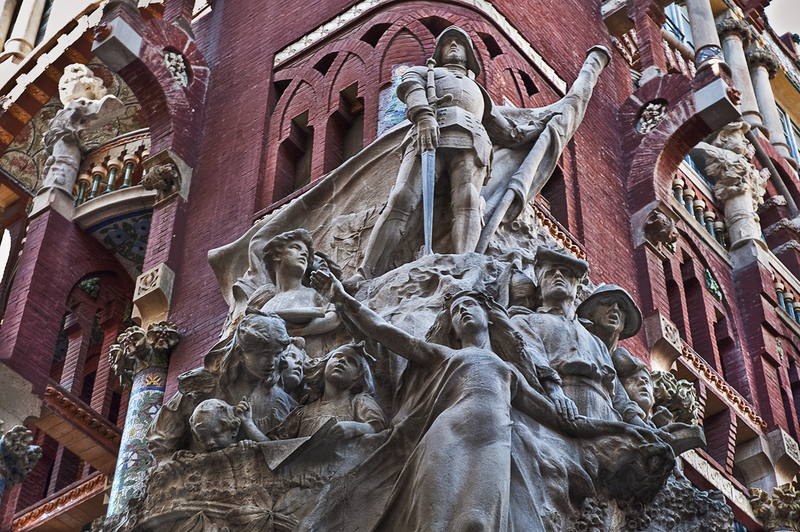 Sculptural group Cançó Popular (Folk Song) by Miquel Blay at one corner of the façade in Palau de la Música Catalana. The group is dominated by the figure of Sant Jordi, patron of Catalonia holding a senyera (our flag) and a sword. In the very center there is a young lady singing and surrounded by common people, workers, men, women and children. so beautiful... i missed this one out. i guess i need more then a week to see whole barcelona. Well framed, an incredible image. Very nice shot! The sculpture for itself... A bit over the top for my taste. Una esquina llena de arte, sin ninguna duda. Los detalles se ven perfectos.